Story: Prince John was the ruler of England while his brother King Richard was fighting in the crusade. While Richard was away, he tried to take over and become the ruler of England while he exploited the country and its citizens. His only problem was the outlaw Robin Hood who stole his money and gave them to the poor. After the return of King Richard, Prince John and his helpers were thrown into jail. Background notes: Prince John is one of the characters from the original Robin Hood mythology. 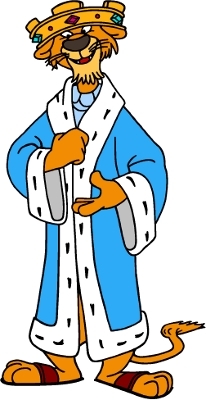 In the Disney version, he first appeared in the cartoon Robin Hood in 1973 (voice by Peter Ustinov), and unlike the rest of the cast, it has not been the only appearance in cartoons so far. In 2002, he reappeared in Mickey's House of Villains along with a long list of villains from Disney's cartoons. In the original stories. In the original stories, Prince John is a tough and evil man, but in the Disney version he was toned down and made into a thumb-sucking wimp calling out for his mommy when things got tough. In comics, he appeared with the rest of the cast in the comic book adaption of the cartoon from Gold Key in 1973, and appeared in the following series The Adventure of Robin Hood which lasted seven issues from 1974 to 1976. After the series folded, he only appeared in a few Robin Hood stories which were made during the late 1970s and the mid 1980s. So far, this version of the character hasn't been seen in other media other than a few pieces of merchandise.